One of the areas of design that can easily be overlooked is function. We can get absorbed with color palettes, textures, and fun patterns- and soon forget that our homes are more than just beautiful places- they are living spaces- and the accents and furniture pieces need to help us live life more effectively. Here are some ideas of "around the house" fix ups that you can accomplish in a weekend to improve the flow and function of your home. 1. Switch up the lightbulbs. Bright lighting is essential for living efficiently and to look your best! Choose a myriad of wattages throughout the home, and while you're at it- switch your bulbs to CFLs to do something good for the environment. 2. Do you have a first aid/ emergency kit? If not, rally up some key items (water, canned food, bandages, flashlight, etc) and store it in a central location in your home- you can even cover the container in a pretty paper or fabric and set it on display! 3. Steam clean your carpets or throw rugs to eliminate any nasty microscopic pollutants that might be hanging out. 4. Your gadget drawer in your kitchen could probably use a good purging. 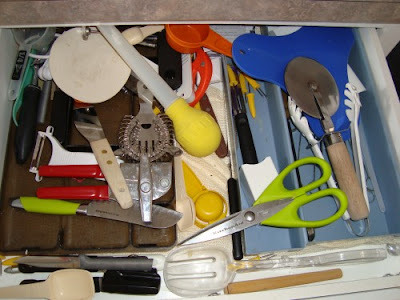 When baking, it can be bothersome to search through a messy drawer to find a simple measuring spoon. Try this- empty the contents of your drawer into a box. Over the next two months, when you use an item from the box, you can consider it a valued tool, and put it back into the drawer. At the end of the two month span, donate the gadgets that you didn't use. 5. Clear off the top of your fridge. Find a new home for the items that live up there by making some cupboard space. 6. Make room in your medicine cabinet by disposing of expired drugs. 7. Let go of any makeup or hair product that you haven't used in the past year. Chances are, the product is past its prime, and discarding will save you from wasting time in your daily routine because there will be less junk to rummage through. 8. Vacuum under the bed and flip your mattress every three months- you'll sleep better!! 9. If you're storing old or broken appliances and electronics, it's time to take action- either fix it up, or let it go. 10. In a storage area, add instant floor space by installing wall hooks, and hang whatever tools you can. 11. Clean up the craft cupboard. It can be easy to hoard items like glitter and popsicle sticks for that potential craft that you may do someday. Assess the likelihood of you actually using the supplies, and donate what you don't need.